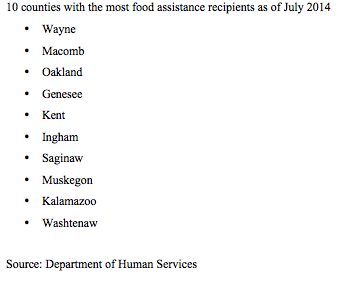 LANSING – Anti-fraud efforts by Michigan and other states should be ramped up to improve the integrity of the $73-billion-a-year Supplemental Nutrition Assistance Program, SNAP, a new federal report says. The ability of states to detect, minimize and punish fraud has failed to keep up with the rapid expansion of the food benefits program for low-income individuals and households, according to the General Accountability Office (GAO), a nonpartisan investigatory arm of Congress. At the same time, GAO said, “technology has provided new opportunities to commit as well as combat such fraud” in what was previously known as the food stamp program. “For example, e-commerce and social media websites have emerged as new venues for trafficking benefits. Conversely, monitoring recipient transaction data may provide clues to potential SNAP fraud,” the report said. But a Washington, D.C.-based think tank cautions that most ineligible claims are due to errors, not fraud. Michigan Department of Human Services officials said the agency’s most effective tool is verifying eligibility. In 2013, such “front-end” efforts avoided $83 million in ineligible payments, DHS Inspector General Al Kimichik said. In October, the department is scheduled to launch an “enterprise fraud detection system” to share information in conjunction with Treasury and other agencies to better coordinate and speed up eligibility verification and disqualification. “We’ll know that information in real time. If they’re intent on gaming us, we’ll know that through the queries and data put into the system,” which will raise red flags for investigation, Kimichik said. GAO examined federal and state anti-fraud activities in Michigan and 10 other states from Oct. 1, 2009, through Sept. 30, 2013. Part of the study looked at recipients in the Detroit and Grand Rapids areas. As of 2012, Michigan had about 4.1 percent of the nation’s SNAP recipients and disqualified 5.28 percent of them, the report said. The federal government pays the benefits for SNAP and administers the program with the states. States are responsible for detecting, investigating violations and prosecuting recipients who abuse the program. The U.S. Department of Agriculture’s Food and Nutrition Service provides guidance and monitoring. •	Selling benefits to retailers for cash. As an example, a retailer lets a recipient charge $100 on a SNAP electronic benefit transfer (EBT) card and gives the recipient $50 instead of providing food. •	Selling EBT cards for cash or non-food items such as rent. In a separate study released in July, the Center on Budget and Policy Priorities in Washington concluded that federal and state efforts to combat fraud have been largely successful. “A careful look at the facts disproves critics’ claim that SNAP is riddled with waste, showing instead that the U.S. Department of Agriculture and states have achieved impressive results in recent years, racking up the lowest error rates on record,” the center said. And policy analyst Yannet Lathrop of the Michigan League for Public Policy said, “We know the error rates are pretty small,” and she noted that errors include cases where recipients receive less in benefits than they’re entitled to. One reason is insufficient staff, although the average caseload per investigator in Michigan actually dropped between 2009 from 9,258 SNAP households to 8,833. Michigan officials also told GAO that recipients who are disqualified “may be required to repay an overpayment but may not have enough income to do so. “One local Michigan prosecutor has established a program that offers to erase the individual’s criminal record if the individual makes full restitution through a repayment plan,” the report said. The program has an 80 percent success rate. Michigan takes a variety of measures to combat fraud, GAO and DHS officials said, including monitoring social media and e-commerce websites for postings that advertise the sale of benefits. LANSING — A Michigan Supreme Court decision cutting a major source of funding for local courts could cost some counties more than $1 million, unless the Legislature reinstates their ability to assess court costs in criminal cases. The decision struck down a long-standing practice that reduced local courts’ reliance on taxpayers after the Supreme Court concluded that they lack the legal authority to collect the money.